Pencils for this, what little there are, are over here on my blog. Ah, that's magic. Lovely work, Chris. COLORS! What a glorious piece of work, Chris! Bloody hell, Chris. Way to throw a curveball. Chris, that's absolutely gorgeous. Just when I thought you reached the plateau of impressing me, ZooOOOoom! That's a beauty Chris, I was completely blown away when I saw this one this morning. The white light touches are perfect. way cool chris. was this done with markers? i dig it. It....It's.....It's so...It's so beautiful *sniff* Shut up! I'm not crying! *sniff* I hate you guys. Right on! Great job, man!! Beautiful! All of these are great, a fine tribute. Really gorgeous all the way across the board from lines to colors. I especially like the trail he's leaving. Tells us a story. If you're gonna fly, fly into a sunset! Beautiful! 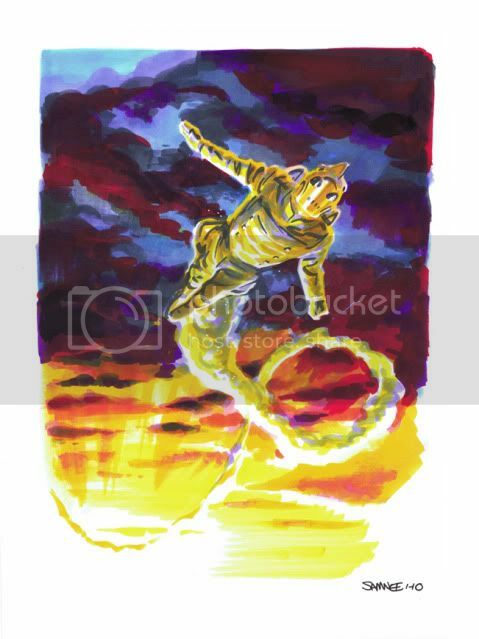 I love the Rocketeer and the coloring on this is awesome.